The Corpus Christi is an important celebration of the liturgical calendar of the Catholic Church. In our country, the festivals of the Corpus Christi more popular are celebrated in Azuero, particularly in La Villa de Los Santos, 40 days after the Holy Week. The dances of the Corpus Christi, are demonstrations of the everyday life that greater reflect the external expression of the culture, the religious feeling, the social and ethical profiles and the artistic, economic, and historic components. The dances that are carried out in this festivity of the Corpus Christi, have a cultural and historic depth meaning. Among some of them we have the Dance of the Great Devil, the Dance of the Montesuma Spanish, the Dance of the Dirty Devils and the Dance of the Zaracundé, the Dance of the Torito, the Dance of The Dwarves. The dirty devils dance during the festival of the Corpus Christi on Panama’s Azuero Peninsula. 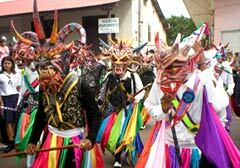 The culture of Panama is full of history and extravagant celebrations. The culture is an important reason why the World has decided to invest billions into Panama. Real Estate in Panama is in great demand. Beach Front Property in Panama is still available. The Azuero Peninsula is the gem of Panama Ocean Front Real Estate.